California Senator Kamala Harris is rallying with Democrats in central and eastern Iowa today and tomorrow. “What’s up, Des Moines?” Harris asked as the crowd at Des Moines Area Community College cheered her introduction. Harris spoke to about 200 people on the DMACC campus early this afternoon. She suggested the conversation about the 2018 election is not only about encouraging others to vote, but doing something of a gut check as a country. Kamala Harris talks with reporters. 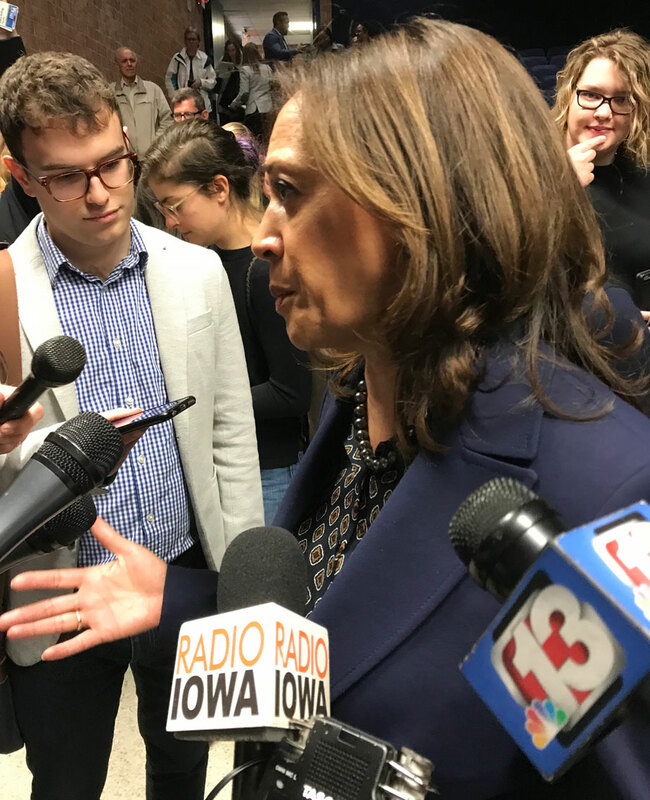 Harris told reporters after her appearance that candidates should focus on speaking to voters about priorities like affordable health care, and job opportunities. 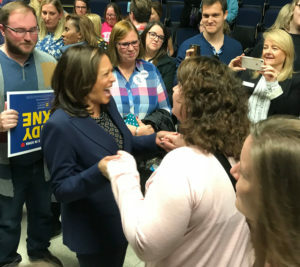 Harris told the crowd in Ankeny that politicians need to deal with the distrust many Americans have in their government and their elected leaders. “We need to speak truth,” Harris said. “…If Charlottesville didn’t make it clear, racism is real in this country. anti-Semitism, homophobia, sexism are real in this country. Let’s deal with those truths, speak them, so we can deal with them. Let’s speak truth…. This economy is not working for everybody,” she said, to applause. Harris headlined a rally in Indianola later this afternoon. It’s part of a campus-town tour that will take her to Cedar Falls and Iowa City tomorrow. Tomorrow night, she’ll speak at a get-out-the-vote rally in Cedar Rapids. Tonight, she’ll appear at a rally with Secretary of State candidate Deidre DeJear in Des Moines. Harris is the first black woman California has elected to the U.S. Senate. Several weeks ago, Harris endorsed DeJear, who would be the first black woman elected to statewide office in Iowa. Harris is among a long line of potential 2020 candidates who’ve visited Iowa, including governors from Colorado, Montana and Washington state, U.S. House members from Hawaii, Maryland and California as well as Harris’ fellow senators from Oregon, New Jersey, Minnesota and Vermont.